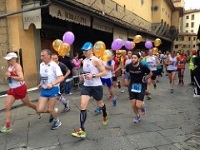 More than 10,000 athletes take to the streets of Florence in the annual Florence Marathon. The 26-mile (42km) race sets off from the Piazzale Michelangelo and crosses the Ponte alla Vittoria. The course winds through the Parco delle Cascine, Piazza del Duomo, and Piazza della Signoria, before ending at Piazza Santa Croce in the town centre. A famously beautiful city, the marathon's extremely picturesque route contributes hugely to its popularity. It takes participants past landmarks like the Ponte Vecchio and the Basilica of Santa Croce, among others. The Florence Marathon was established in 1984 and is now the second largest Italian marathon, the first being the Rome Marathon. Italians make up the majority of competitors but many international runners also compete. There is a Marathon Party after the event, with Tuscan food and a live music concert. There is also a fun Family Run which kids love to participate in.